I joined Safeway a few weeks ago, after moving here from another state and was surprised to find how differently grocery items are priced here. If you are looking for a grocery store to join, Safeway seems to be one of the best for regular grocery shopping. Beyond reduced prices for club members, they also have coupons available online that can be automatically added to your card, plus gas rewards. Anyway, I love bananas, but hadn’t bought them since moving since $.69 per lb is a bit high for us to buy twice a week. 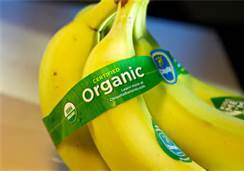 Yesterday, I spent more time browsing for deals and found out that with my safeway card, ORGANIC bananas are actually cheaper than regular bananas at $.59 lb. I still wish they were a little less, but organic and at that price, I’m game. They are delicious. This entry was posted in Uncategorized and tagged cheaper price, gas rewards, grocery shopping, member card, organic bananas, reduced price, Safeway. Bookmark the permalink. ← Free is Good. Free and Organic is Even Better. Cheaper? Really? $.59 lb. is darn cheap. You have to factor in that these bananas were cared for and watered till maturity, then picked by hand, loaded onto a continues chain of trucks for transportation until it they reached you – think about all that gas. Yet you want them to be cheaper? I paid $.99 lb. and I thought that was a fair deal. I’m not arguing that it isn’t enjoyable to have fruit and vegetables from all over the world available at the nearest grocery market. This was something that I learned that day; that it was cheaper. Nevertheless, yes I enjoy grocery items being on sale, I enjoy items being cheaper. If .99 is reasonable price for you to buy bananas, I am not criticizing you for your choice.